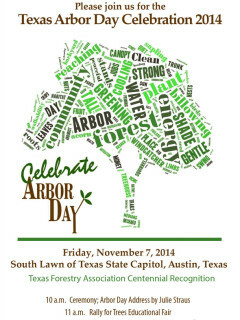 Celebrate Arbor Day on the south lawn of the Texas State Capitol at this fun, family-friendly event. Following a ceremony at 10 am, children and adults alike can enjoy an educational fair and learn why trees are so important — and how to plant and care for your own! Join the Texas A&M Forest Service and the Texas Forestry Association for booths, games and giveaways, including 300 bur oak seedlings. The Arbor Day address and ceremony will begin at 10 am with the fair following at 11 am.